Website and processes: 1 Sep 17 Michelle P, 5/5 Excellent "Excellent,site very easy to use. Used chat facility and quickly got answer to my query. 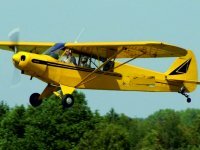 Looking forward to flight experience"
The Super Cub is one of the worlds most popular and versatile aeroplanes tracing its roots back to the 1930's; Type used for aerial reconnaissance during D-Day. On the day you will be accompanied by your instructor out to the aeroplane for a pre-flight breifing and pre-flight inspection of the aeroplane. All the primary controls will be explained to you. Your instructor having started the engine will call up for taxi, and you'll have the oppertunity to taxi the aeroplane yourself out to the runway. The instructor, having performed the necessary pre-flight checks will invite you to follow through lightly on the control for the take-off and the climb up to a safe altitude. At whih point they will demonsrate the further effects of controls and we invite you to take complete control of the aeroplane. You may expect to handel the aeroplane up to 95% of the total flight time. However the flight is yours, and you may do as much or as little flying as you feel comfortable with. You can fly the aeroplane out over the sea, along over the South Downs National Park, or wherever you wish. The instructor may help you accomplish, or offer you to follow through on the controls for the landing. Shoreham Airport is located 4 miles West of Brighton, and right on the coast line, next to the beatiful River Adur, in the South Downs National Park, an area of outstanding national beauty. The airport itself is Britains oldest licensed airport, being opeartional for over 100 years! Whilst your ejoying the breathtaking views from the sky, Friends and family would have the oppertunity to visit the origional Art Deco restaurant or take a walk around the small Shoreham Airport Museum. Bring you swimwear as the Beach is near by! Free Parking for customers ands there accompanying friends and family!